Senior Jimmy Daniels (second from right), posing with his crew after winning the 2018 Division I Regional National Hot Rod Association championship. Balancing sports and education is a challenge every college athlete has to face. Between schoolwork, traveling and training, it’s fair to say that an athlete’s schedule is beyond hectic. The benefit of being an athlete on campus is that mostly everything you need for training and travel is supplied for you. When you’re not an athlete for your school, however, things become much more challenging. Jimmy Daniels, a senior biology major, knows this very well. The 22-year-old commutes from his home in Yardley, Pennsylvania to his classes every day before going home, doing homework and working on his now-championship-winning race car. The NHRA hosts two distinct levels of racing: the national circuit travels around the continental United States. The divisional level sees drivers travel across a set region to compete for region-specific championships. Seven divisions make up this level of racing in the NHRA. Jimmy won the 2018 championship in the northeast division. Going into October of the 2018 season, Daniels trailed in points and traveled outside his division to collect more, as allowed by the NHRA on two occasions per driver. His team drove down to Rockingham, North Carolina, and collected a win. He traveled back home to attend his classes then traveled to Oklahoma later that week. “We were driving home from Rockingham, and the following weekend there was a race in Oklahoma, so my girlfriend’s father took my motorhome and trailer out to Oklahoma and I flew in Thursday after school. It’s tough; it’s very time consuming,” Daniels said. The win at Rockingham and his performance in Oklahoma helped propel Daniels in points and, at season’s end just weeks later, he was crowned champion, beating over 100 competitors in the point standings. Daniels’ history in racing, however, reaches back to his childhood, and starts with his dad. Daniels ran in a junior dragster division for a short time before joining his father’s race team in 2014, when he started racing in a 1980s Chevrolet Camaro. In 2016, he took over the more powerful 1968 Dodge Dart which his father raced before him. Daniels does servicing and maintenance which includes everything from bumper to bumper — engine, suspension, body and chassis, just to name a few. “You have to be 100 percent focused to get the job done, it’s hard to convey that to people who don’t understand,” James Daniels said. 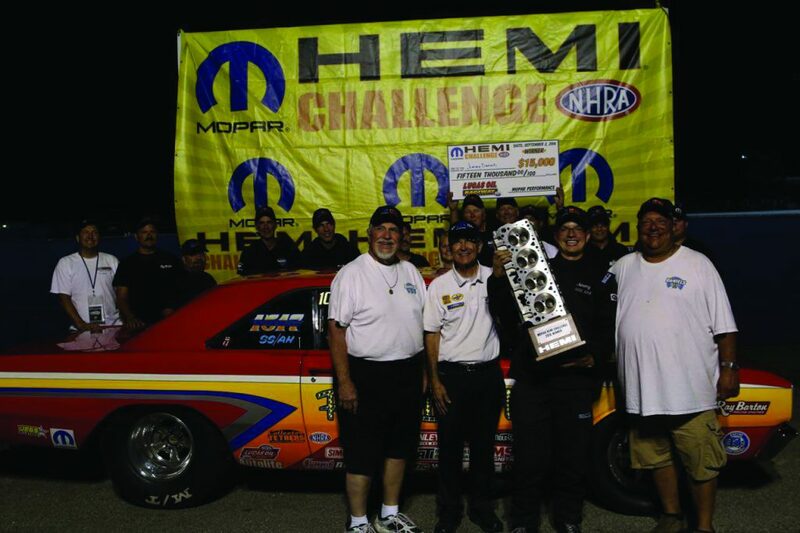 Daniels’ NHRA resumé also highlights him as the only driver in NHRA history to win three-consecutive Dodge Hemi challenges, an annual event at Lucas Oil Raceway in Indianapolis. It’s one of many weekends he spends at the track. “Usually, I have about two or three weekends off out of the whole summer that I’m not racing,” Daniels said. With graduation closing in, Daniels now is looking forward to his future, which he hopes includes more racing. However, he has a back-up plan which requires more school. “I’d really like to go into racing, but my dad’s a dentist and that’s what I’m working toward right now,” Daniels said. Daniels will start the 2019 NHRA season as the defending champion in his division in a few short weeks, and will graduate at the end of the spring 2019 semester. Published in the Feb. 6 edition.